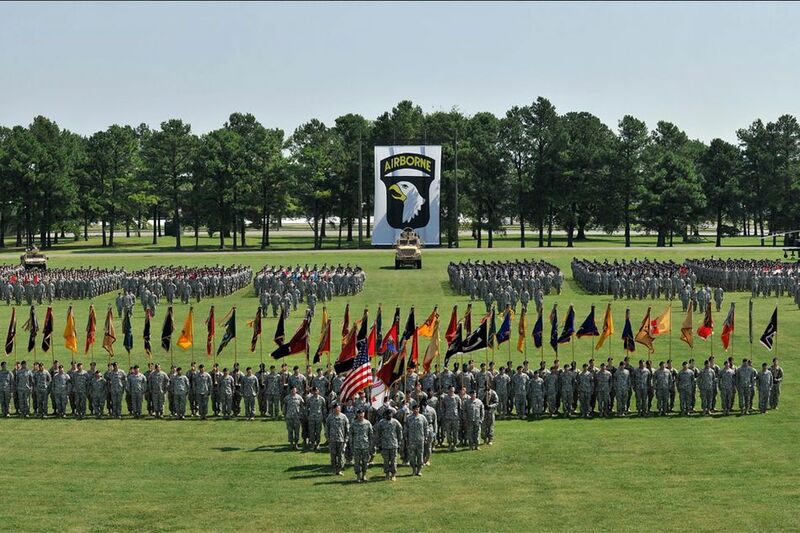 Fort Campbell's primary mission is to advance the combat readiness of the 101st Airborne Division (Air Assault) and the non-divisional units posted at the installation through training, mobilization, and deployment. Fort Campbell's Air Assault School conducts classes annually for thousands of soldiers. Fort Campbell is located on the border of Tennessee and Kentucky, 55 miles from Nashville and 190 miles from Louisville. It's one of the largest military installations in the world, at 164 square miles. The Army's Special Operations Aviation Regiment (SOAR), and special ops soldiers including Rangers and Green Berets are all residents of this base. All major airlines fly into the nearest airport in Nashville. You must have a Common Access Card (CAC) or visitor pass when entering the post at Fort Campbell. Housing is provided on Fort Campbell for officers, enlisted soldiers, and their families. It has seven schools, a major hospital, child care facilities, numerous chapels, banks, restaurants, post exchanges, service stations, campgrounds, swimming pools and most other facilities a civilian city of the same size would have. Housing of all sizes is available, many of them handicap accessible. Central air conditioning, stoves, refrigerators, and dishwashers are available in family quarters. There are no Senior Enlisted Quarters (SEQ) or Officer Quarters housing units on post. Three school systems serve the Fort Campbell area: Fort Campbell Domestic Dependent Elementary School System on the post, Kentucky/Hopkinsville/Oak Grove - Christian County School Systems and Tennessee-Clarksville Montgomery County School System. Kentucky/Hopkinsville/Oak Grove - Christian County School Systems has ten elementary schools, three middle schools, and two high schools. Bus transportation is provided. In addition to the traditional educational settings, programs are offered at a career and technical center, a day treatment center, an alternative school, an optional high school, an adult education center, and Hopkinsville Community College. Blanchfield Army Community Hospital serves the Fort Campbell community. Its services are on a priority basis. First priority is to the active duty military, second priority is to family members of active duty personnel, followed by retired military and family members of retired military. Dental care services are available to active duty military only on the post. Only emergency dental care is offered to other eligible individuals. All family members are assigned to family clinics or primary clinics. The Young Eagle Primary Care Clinic provides care to Family Members of active duty Soldiers and retirees 17 yrs and younger. Care includes well-baby exams, school, sports physicals, acute and chronic illness diagnosis and management, and diagnosis and management of developmental or behavioral problems. Fort Campbell has five child development centers which provide quality full-time, hourly, before and after school and part-day preschool programs to children 6 weeks through 5 years of age. Care for special needs children is also available.